Last night, I made cheese enchiladas with a crumbling "queso fresco" I purchased at a local Latin market. While I would normally make a yellow rice using very good quality saffron to accompany a Latin dish, I decided to try making a green rice. 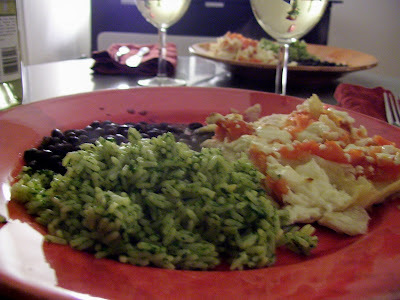 The rice I made to accompany the enchiladas came from the book, "Moosewood Restaurant Simple Suppers: Fresh Ideas for the Weeknight Table," published by the Moosewood Collective. I was surprised by how flavorful the green rice tasted, especially considering the recipe called for using water, as opposed to vegetable stock, and spinach, as opposed to, say, cilantro. I always make extra rice for dinner, which I top with a fried egg for breakfast the next day. (Heat the cold rice in the microwave for about a minute.) With leftover white rice, I will also drizzle some soy sauce on top. Growing up, I probably had fried eggs over rice for breakfast at least 5 times a week, because I just really disliked boxed cereals. Heat oil in a saucepan under medium heat and saute the rice in the oil to coat each grain, about 1 minute. Add the water and salt, bring to a boil, cover, and reduce the heat to very low. Cook rice until all of the water is absorbed, about 15-20 minutes. While the rice cooks, coarsely chop the scallions and, if necessary, rinse the spinach. (I used a half bag of pre-rinsed spinach.) In a large skillet, saute the scallions in 2 teaspoons of oil, about 1-2 minutes. Add the spinach and pepper to the skillet. Cover and cook until the spinach has just wilted but is still bright green, about 2 minutes. In a blender, puree the spinach and scallions until smooth. Add a little bit of water, no more than a 1/4 cup, if necessary. When the rice is done cooking, stir in the spinach/scallion puree, fluff the rice with a fork, and serve. I assume you're referring to the Washington Post link. When you are drafting your blog entry, highlight the word you want to use as link and then click the "link" icon along the top. If you click on the link icon, an "http://" pops up. Just copy the web address you want into that space. Hope this helps. Also, the fried eggs over rice thing is common among Asians and, I've just learned, among Latinos as well.